Note: this option is available for paid versions only. The Mail Merge feature is used to create a set of documents combining a common content which is taken from a text document and some individual components (variables, such as names, greetings etc.) taken from a spreadsheet (for example, a customer list). It can be useful if you need to create a lot of personalized letters and send them to recipients. A data source used for the mail merge must be an .xlsx spreadsheet stored on your portal. Open an existing spreadsheet or create a new one and make sure that it meets the following requirements. The spreadsheet should have a header row with the column titles, as values in the first cell of each column will designate merge fields (i.e. variables that you can insert into the text). Each column should contain a set of actual values for a variable. Each row in the spreadsheet should correspond to a separate record (i.e. a set of values that belongs to a certain recipient). During the merge process, a copy of the main document will be created for each record and each merge field inserted into the main text will be replaced with an actual value from the corresponding column. If you are goung to send results by email, the spreadsheet must also include a column with the recipients' email addresses. Open an existing text document or create a new one. It must contain the main text which will be the same for each version of the merged document. Click the Mail Merge icon at the Home tab of the top toolbar. The Select Data Source window will open. It displays the list of all your .xlsx spreadsheets stored in the My Documents section. To navigate between other Documents module sections use the menu in the left part of the window. Select the file you need and click OK.
Once the data source is loaded, the Mail Merge setting tab will be available on the right sidebar. Click the Edit recipients list button on the top of the right sidebar to open the Mail Merge Recipients window, where the content of the selected data source is displayed. Note: to learn more on how to use the filter you can refer to the Sort and filter data section of the Spreadsheet Editor help. Note: to learn more on how to use the Find and Replace tool you can refer to the Search and Replace Functions section of the Spreadsheet Editor help. After all the necessary changes are made, click the Save & Exit button. To discard the changes, click the Close button. 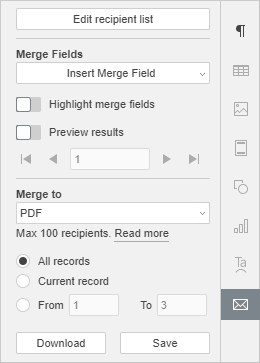 Place the mouse cursor in the text of the main document where you want a merge field to be inserted, click the Insert Merge Field button at the right sidebar and select the necessary field from the list. The available fields correspond to the data in the first cell of each column of the selected data source. Add all the fields you need anywhere in the document. Turn on the Highlight merge fields switcher at the right sidebar to make the inserted fields more noticeable in the document text. Turn on the Preview results switcher at the right sidebar to view the document text with the merge fields replaced with actual values from the data source. Use the arrow buttons to preview versions of the merged document for each record. To delete an inserted field, disable the Preview results mode, select the field with the mouse and press the Delete key on the keyboard. To replace an inserted field, disable the Preview results mode, select the field with the mouse, click the Insert Merge Field button at the right sidebar and choose a new field from the list. Note: the recipients' email addresses must be specified in the loaded data source and you need to have at least one email account connected in the Mail module on your portal. Note: the maximum allowed quantity of recipients is 100. If you have more than 100 recipients in your data source, please, perform the mail merge by stages: specify the values from 1 to 100, wait until the mail merge process is over, then repeat the operation specifying the values from 101 to N etc. click the Download button to store the file anywhere on your PC. You'll find the downloaded file in your default Downloads folder. click the Save button to save the file on your portal. In the Folder for save window that opens, you can change the file name and specify the folder where you want to save the file. 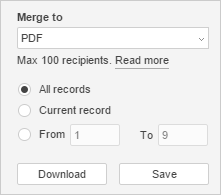 You can also check the Open merged document in new tab box to check the result once the merge process is finished. Finally, click Save in the Folder for save window. In the From list, select the mail account you want to use for sending mail, if you have several accounts connected in the Mail module. 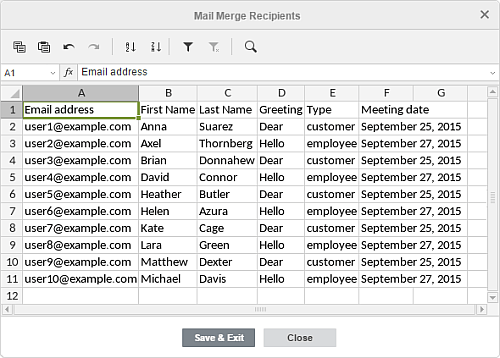 In the To list, select the merge field corresponding to email addresses of the recipients, if it was not selected automatically. Enter your message subject in the Subject Line field. Select the mail format from the list: HTML, Attach as DOCX or Attach as PDF. 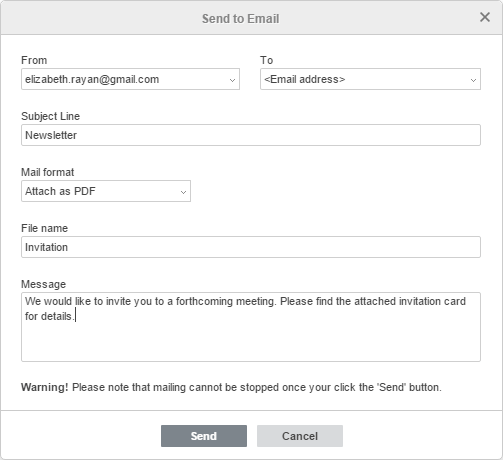 When one of the two latter options is selected, you also need to specify the File name for attachments and enter the Message (the text of your letter that will be sent to recipients). Once the mailing is over you'll receive a notification to your email specified in the From field.